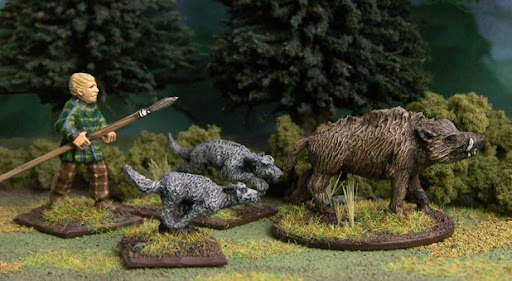 The Foundry sells a very nice celtic wild boar hunt set, but I decided to compose my own. The Celtic hunter comes from a set of Gripping Beast Celtic spearmen. The two hounds also come from GB. The boar is from Amazon Miniatures. I added some green stuff (putty) to the pig's back to create a more menacing ridge of bristling fur. When preparing the hunter model I missed the mold line running vertically up his face. I noticed it only after priming the figure and painting the flesh base coat. I didn't want to scrape away the paint to cut off the extra metal, as this will tear the layer of paint. I instead worked with it, painting the small ridge pink to represent a scar (wild boards are quite dangerous, you know). Although sold as "wolf hounds," I like to consider these dog models to be deer hounds. An Iron Age bronze figurine of a deer hound was found at the Lydney Temple, Gloucestershire. So, this is an ancient breed indeed! Here's something interesting about Iron Age Celtic hunting: One would naturally assume that the Celts hunted all the time, supplementing their diet with the deer and boar running through their country. However, there is very little archaeological evidence to suggest that this happened. The overwhelming majority of mammal bones found on Iron Age sites are from domestic breds. It seems that the hunt was more of a spiritual event, rather than a means for food. Hunting a wild boar on foot armed only with a spear must be a frightening experience and, having come face to face with one, I think you might end up with a bit more than a small scar if you poked one with a sharp stick! The local Farmers hunt wild boar on our farm in France and they have a lot of respect for them; there are always at least half a dozen people with rifles. One year they messed up and wounded a boar without killing it. There was a big operation to track the wounded animal down and finish it off before it hurt someone. It was quite scary! We used to have an Irish wolf hound and these models actually look more like deer hounds. Our dog was quite a bit more heavily set than these models and taller; he easily came up to my waist and I'm 6'3". These models might mx well with 20mm figures. Could you put them in a photo next to some of your 20mm Celts? You have a farm in France populated with wild boar?! Cool! I know someone with a Scottish deer hound. It has such a relaxed and friendly personality. Great dog. I would love to have one as a pet, but it would never fit in our small house! 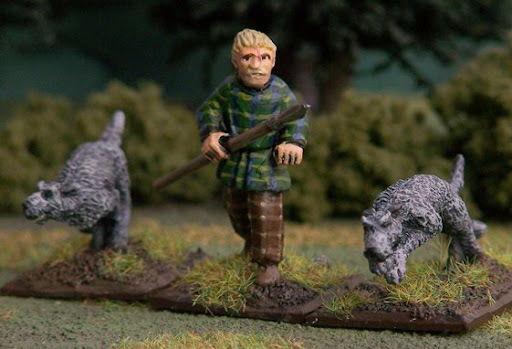 I'll take a photo of the dog with a 1/72 celt. I love the idea with the scar. I am embarrassed to say that I have had to do this more than once, even adding a few scars to conceal my cover-up even better. I can imagine that Iron Age Celts were no less practical than other societies, being far more civilized than we commonly give them credit for. Why risk energy, resources, good fighting men and weapons when you can just grab pork from the pen. I hate to be pedantic (actually I quite enjoy it), but there is no evidence that the pigs were kept in pens. The herd would have been roaming the woods for most of their lives. Well, figurative speech aside, I'm sure you got the jist. Domesticated meat was available enough, was my point.